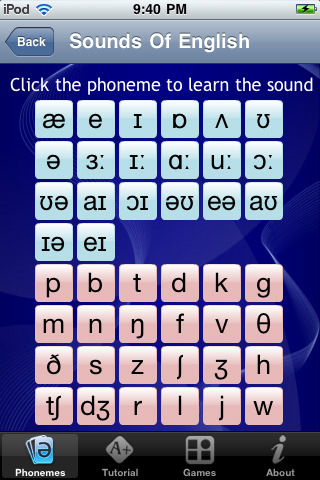 Phonemica is a learning app for the iPhone that is your complete guide to grasping and understanding phonetics. It was developed by Astrarka Educational Solutions, is compatible with an iPhone and iPod Touch, and costs $0.99. The app takes an in-depth look at speech sounds and their corresponding symbols in an attempt at demonstrating proper pronunciation of the English language. If you were taught English from a young age, Phonemica is a trip down the “Hooked on Phonics” memory lane. You get a lot in return when purchasing this app. To start with you get an uncut tutorial on phonemes. Phonemes are atomic sounds that make up the language; for example Æ represents the sound we make when pronouncing the “a” in the words hat, apple, mask, and hand. A table is provided with all of the phonemes and when you click on each one a recording plays to let you know how the sound is pronounced. There are 44 phonemes in the English language. Just for perspective, there are only 26 letters, meaning that there are almost twice as many ways to pronounce letters, as there are letters. After you get a breakdown of what a phoneme is you can toggle to the tutorial section. In the tutorial section you get a lesson in vowels, consonants, graphemes, and a review at the end of your crash course. Graphemes, by the way, are written representations, consisting of one or more letters, of a phoneme. The next section of the app is the games. Oddity, Phonic Match, Sound Scribe, and Hangman are the four games offered. Hangman is the most entertaining of them all. You are given a phoneme, /sent?gre?d/, and it is up to your powers of knowledge retention to figure it out. Once you realize that it is centigrade (for example) you start typing in the word c, e, n, etc. and the game fills it in for you until you have a match. I love Phonemica because I cannot get enough of the learning apps. You never know when you will meet a person who mispronounces everything and who you will need to show Phonemica to. When the person has gotten an earful from the app indicating the correct pronunciation, do your best not to gloat. AppSafari review of Phonemica was written by Vanessa Paszterko on October 25th, 2010 and categorized under App Store, Education, Reference. Page viewed 3905 times, 1 so far today. Need help on using these apps? Please read the Help Page.